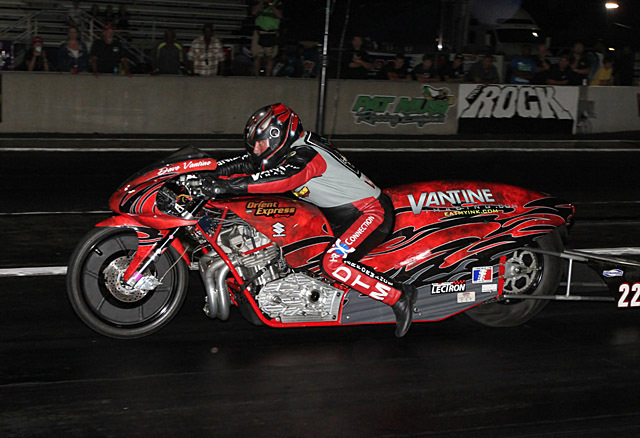 Veteran Pro Extreme Motorcycle racer David Vantine came to the American Drag Racing League’s marquee Dragstock X race at Rockingham Dragway fresh off his sparkling Top Fuel Motorcycle debut a couple weeks earlier at Indianapolis. That nitro momentum carried him straight to number 1 qualifier in the first round at The Rock, which he held onto and improved to lock down the top seed by a wide margin over a very competitive field for eliminations. “That was a great start to the weekend,” said Vantine. “We haven’t been in the .0s for two years now and we ran a 4.07 in qualifying to secure the number 1 spot. That’s also a first in the ADRL for me, so that was good. 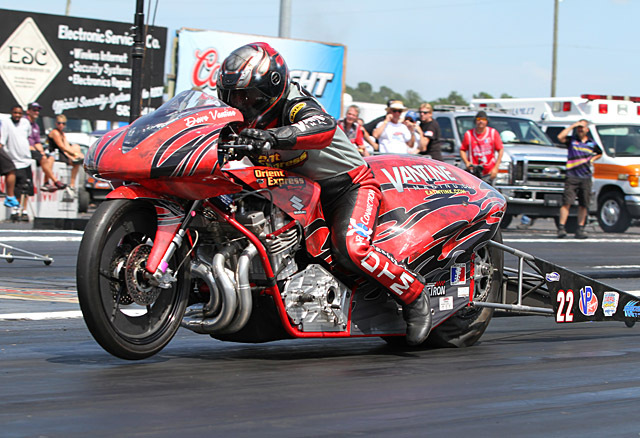 Motor, rider, and crew chief Joe Taranto all stayed happy into round 1 of eliminations, with Vantine running a 4.10 to advance. “We put a 4.10 tune-up in it and it ran 4.10—not bad,” laughed Vantine. Vantine faced fellow DTM Performance customer and quasi-teammate Terry Schweigert in E2. Schweigert was breaking in a brand new bike, and on a couple of passes—this one included—the bike made a hard roll onto the left edge of the tire at launch. Vantine slowed slightly but still advanced. The semifinal match-up for Vantine was of course the tough one—Eric McKinney, who earlier in the day locked up his second straight national championship. McKinney had lane choice, but also had been struggling on the weekend, so there was reason for optimism under the Vantine awning. But champions are hard to beat, and McKinney was doubly motivated after letting the ADRL Belt slip out of his hands on Friday. He took the tree and ran his quickest lap of the day so far to advance over Vantine, then went on to win the event over Paul Gast in the final. “The first couple of rounds today went pretty well, but for some reason I thought my lights were a lot better than they actually were,” laughed Vantine. “I leaned on the tree—so I thought—but Eric definitely left on me and had a better bike, so the weekend ended there. But I’m happy. Since we’re running the Top Fuel bike and doing a limited ADRL season, I thought we did a pretty good job. “Big congratulations to Dave Norris for winning the Belt. Actually, a lot of people stepped up this weekend. The Grothus’s did a great job. I mean the class is crazy. If you look at Casey Stemper—he was ruling the world and now he’s struggling. It just depends on whose turn it is in the barrel. The only team that never seems to have a real bad weekend is McKinney’s, and they work real hard. Everybody else, from Billy Vose to everybody, has been on top and gone to the bottom. The whole class is an anomaly. 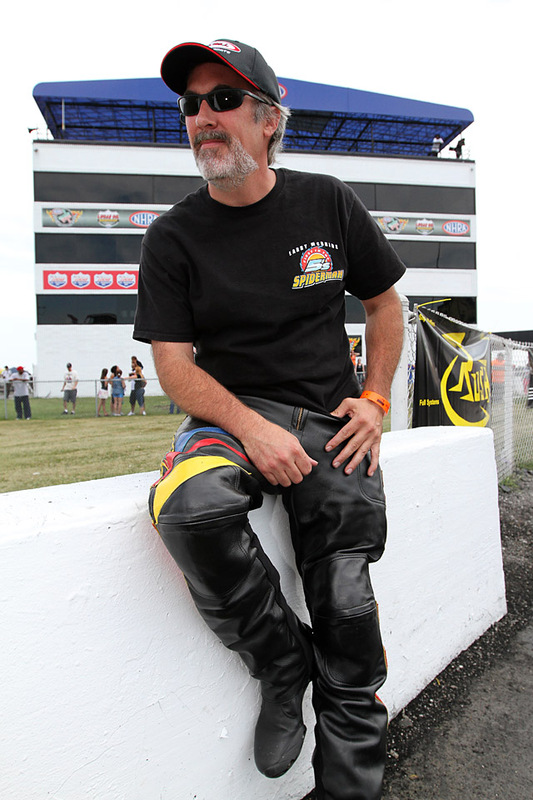 “I want to thank the ADRL for a place to race, and my crew, as always—U.B. Smith, Joe Taranto, Genie Muldoon, Jim Althaus, Paul Vantine, and Dan and Kathie Wagner. Dan does all my engines, all the wiring, and consults back and forth with Joe, and we do share information on our bike with Terry Schweigert. And I want to thank Timblin Chassis. The chassis was really nice this weekend, been nice since I got it, always goes nice and straight. I also want to thank my girlfriend Laurie Valenti and all the employees at Vantine Imaging http://www.vantineimaging.com/home.html , they are what allows me to do this. David Vantine returns to action along with Pollard Nitrosports November 8-10 for the Haltech Manufacturers Cup at Bradenton Motosports Park in Florida.